Finding that perfect aquarium kit for your Betta can be a tough thing to do, especially when most small fish tank kits come with just the basics. The Marineland Portrait Aquarium is one of those kits that come with (almost) everything you need. You can’t blame them for almost being perfect. This tank is the perfect size for your Betta and other small fish. Its unique and stunning design has captured the hearts of many Betta lovers. 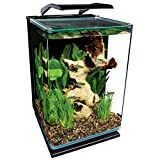 It has an awesome moonlight and daylight LED setting that give it an edge over other small aquarium kits. With this feature, you get to choose between a bright white light during the day and a soothing blue light at night. You can also add a timer for the ultimate hands off experience. If you’re looking for a great Betta tank that fits almost anywhere then you need to check out the rest of this review and discover all the benefits the Marineland Portrait Aquarium Kit has to offer. How Does The Marineland Portrait Aquarium Stack Up To Similar Kits? As we start off, we should agree on one thing – the Marineland ML90609 is one sleek and elegant looking aquarium. The tank is tall but still very stable and feels extremely durable. It has thick strong glass and it’s great construction contributes to its durability. One really cool feature is the curved corners! When compared to traditional aquariums with rectangular corners, the Marineland Portrait kit looks elegant and expensive. These curved corners not only look great but allow you to look into the tank from different angles, for new and exciting perspectives. The smooth corners also make cleaning algae on the glass surface a breeze. Hidden at the back of the aquarium is the plastic compartment that houses the filter and pump. The hidden compartment plays an important role in keeping the aquarium looking clean and free of clutter. The Marineland portrait kit is compact and can fit into small spaces or on a desk. But even with its small compact design, it still provides a decent volume of 5 gallons, which is an awesome size for Betta fish. At the bottom there is a plastic base supporting the entire weight of the tank which allows the tank to remain sturdy as though it was bolted to the surface. The LED lighting is really where the Marineland ML90609 excels. The lighting is supported by hinged plastic stand that allows the light to hover over the tank. The LED strip features 9 white LEDs and 6 blue LEDs. In addition, the lighting is complimented by a 3 position switch and a 2-mode operation. The white light mimics the natural sunlight refraction creating a perfect environment for your fish while the blue hue light mimics the serene moon’s shine. The filtration system is another great feature for this little tank. The compartment is located in the back so it’s hidden from sight and ultra quiet. This allows you to focus more on the beauty of your Betta. The compartment allows for Marineland 3-stage Rite-Size Z cartridge filter technology. These 3 stages of filtration include mechanical, biological and chemical stages. The carbon in the filter performs the chemical filtration while the biofoam bit takes care of the biological and mechanical stages. Easy to assemble, so you can be up and running quickly. The LED has 3 position switch and a 2-mode operation great for a natural setting. The 3-stage filtration system is efficient and thorough in cleaning the tank water. The back compartment hiding all the mess contributes to a beautiful view free of distractions. The LED lighting is a little dim. If you intend to grow high light plants, you may want to purchase additional lighting or use CO2. Note that the Marineland Contour aquarium features brighter lighting. You will have to purchase a submersible water heater separately. When you open up the box you will have everything you need to complete a basic aquarium setup. And of course a 5 gallon portrait sized glass aquarium. Unfortunately, the contents of the Marineland ML90609 are pretty basic and do not give you everything you would need to recreate the scenic beauty you see on the box. If you’re more of a visual person check out this video unboxing of the Portrait Aquarium Kit by Marineland. And of course you’ll need a submersible heater and thermometer to help regulate the temperature in the aquarium. Find the ideal spot for your aquarium (preferably a surface that can support over 40 pounds). Add filter media. Be sure to wash the filter to get rid of the dust and carbon dust. Add your substrate. You can use either gravel or sand. If you choose gravel, be sure to clean it thoroughly before adding it to your tank. Rinse the decorations and plants, then place them anyway you like. Inset your heater in the back compartment. Attach the lights and plug in all relevant cords. Treat your water using a water conditioner of your choice before pouring the water into the tank. Before you add your fish, let the water cycle for some time to increase the chances of fish survival. Watch this video by Hickster58 for a better understanding of how the above steps are implemented. Here is a helpful video that compares the Marineland Portrait and the Marineland Contour aquariums. Overall, it’s simple design, great lighting and beautiful look make the Marineland ML90609 Portrait Aquarium an awesome choice for beginners, Betta lovers or aquarists in need of a small fish tank.